Manulife US REIT announced their Q3 2018 result not too long ago and generally, it is not filled with surprises. However, much of the attention was taken away from the results, the focus being on its falling share price. The current share price (2018 Nov 23) is US$0.77. If we annualized the adjusted DPU of US$0.0152 we get a dividend per share of US$0.0608. The dividend yield is 7.89%. Rather juicy. Gross revenue improved 75% as did net property income. The income available for distribution improved by 64.9% versus last year. The main reason for the rise is due to contribution from an enlarged property base offset by a large number of outstanding shares, due to rights issue. The DPU rose 33.6%, but this is very misleading owing to a few preferential offering and rights issue. This enlarged the amount of outstanding shares. It is very distorted but let us be clear that if you did not subscribe to the rights issue, you would not have been DPU accretive. However, had you subscribed the adjusted DPU of 1.52 cents, you should be accretive. The REIT also signed 8 leases with an average of 13.5% rental reversion. This includes one mid term rent review. This article is also another deeper dive of what I could gather from the management. And by the time you have finish reading this article, you should have a very good idea about how the management operating, think about things. 30% of Michelson’s leasing income is expiring in 2019. That is a sizable expiry and for shareholders, this is probably something to be concerned about. If this is an expiry by some of the local office REITs, shareholders are less concerned because they have a good idea about the leasing climate in Singapore and Hong Kong. USA leasing presents a different culture, and when you have a REIT with properties there, you do not know if they can execute well. Even before we can plant that question, management updated that they have been negotiating with the key tenants (Hyundai Motor Financials and Jones Day mainly) for the past year. They have their fingers crossed that there will be some updates in the Q4 2018 result. One analyst asked about the management’s opinion on the rise of co-working space. Manulife is very familiar with this concept. The management was rather cautious about having a large tenant base that is based upon co-working tenants. They were also quick to note that, while co-working space seemed new to the region due to the rise of WeWork, this concept have been more prevalent in the western world much longer. While co-working spaces are getting more prevalent, they still occupy just 3% of the entire USA office space by NLA. They believe in Singapore is still less 5% right. They would rather work with stronger, more established players. If a co-working tenant are willing to lease for 5 to 7 years, Manulife will consider exploring such opportunities (this is still a tad shorter than the typical 5 to 10 years of leases). Due to right sizing the days of large corporate offices might not be coming back. One interesting thing is that the valuation of the property is affected by the tenant mix. And if you have more than 10% of your tenant base on these co-working tenants, that will be a penalty on valuation of the building. One main reason is that the leases of these co-working space tenants are rather short. In USA, some of these leases could be on a month by month basis (some 3+3 months or 1 + 1 year). The CFO explained that the valuation of a building is affected by general vacancy, and credit loss. So if you have less established tenants with shorter credit history like the co-working space companies, this affects your valuation. While a landlord like Manulife could charge them a higher rent, there are a fair bit of tenant incentives given for them to signed on as well, so that would negate the higher rental revenue. Your CAP rate could go up but they are not going to stay with you for a longer time and secondly, you will be investing in more capital upfront to make the space look good for them, which will impact your cash flow in the early years, with much less cash flow in the latter years. Someone asked this question to the management: How come the government tenant at Penn is tied to a long lease, yet the lease do not come with any rental escalation? I think the worry is, if inflation accelerates, the company will incur a large opportunity cost on a long rental lease. Secondly, when the debt is refinance to a higher interest rate, there are not much chance for the rent to be revised upwards. Manulife’s Penn might become a potentially unprofitable asset. Penn has a WALE of 6.8 years and leased to United Nations Foundation, Department of Treasury mainly. The earliest expiry is 7% of the gross rental income in 2020. The passing rent is 12% lower than current market rent. The management have this answer for Penn: If you have a government agency as a tenant, their credit is so high that the government agency do not have to pay rental escalation. That comes across as very weird for me and I am not going to dispute that claim. The CFO did provide more color to the nature of the lease. He explained that Penn is on a Gross Base Stop Lease. This means that a base level of expenses are identify, which is typically the annual expenses of the prior year. Manulife would pay that base year of expenses. For subsequent years, if the expenses rises with inflation above this base year expenses, these expenses would be recovered from the tenant. In this way, if expenses go up with inflation, Manulife is protected. They will continue to earn that cap rate spread. However, if the lease is long, they will still miss out on the opportunity cost and the cap rate on cost of property do not increase because there isn’t any rental escalation. They would have to depend on mid term rent review. Due to these recovery income, it makes Manulife’s portfolio NPI margin to be +-65% while the typical Singapore REIT’s NPI margin would be around 80%. As you can see recoveries income is a fair bit. If we take this out, the revenue would be lower, closer to the net rental income. Thus the margins would be higher. It is probably how differently the US REITs and Singapore one account for things. The advantage that I see with so much cost recovery, as explained in the previous section is that all the rental escalation, and expense recovery will flow from the top line to the bottom line. This creates some operating leverage, allowing the distributable income to grow. However, I do have a concern how long WALE net lease will fair in a rising interest rate environment, versus shorter tenant lease properties. And in my previous article, I did some sensitivity analysis what would happen in some realistically pessimistic rising interest environment. I asked the management this question and the CFO replied that the nature of these cost recovery and rental escalation would alleviate that. As the gross rent will grow by a fixed amount over time, but your debt is fixed. When your debt is refinanced with a higher interest expense, your passing rental yield matches that interest expense because it has been escalating. Now I am skeptical how that works. More so for Penn. So I decide to do that simulation again. In the table above, I showed a hypothetical property with a initial CAP Rate of 5%. We borrow 35% of the cost of the property with a 4 year interest only loan with an interest rate of 3.3%. Due to the leverage, the income yield of the property is 6.68%. Like Penn, this property is on a Gross Base Stop Lease. All the expense above $400, is paid back by the tenant. 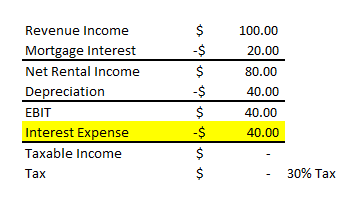 So in the above illustration, you can see expense stayed constant at $400. However, the revenue grow at 2.1% a year due to the inflation of expenses. The increase flows to the NPI. The management fee stays a constant $50. You notice that the income yield rose from 6.68% to 7.67% in the fourth year, before plunging to 6.56%. The 4th year income yield is even lower than that of the first year. The interest rate needs to be lower to 5.7% in order for the 4th year income yield to be better than year 0. I realize that my revenue growth here is based on revenue. If this was to follow Penn, where the expenses are lower, the eventual revenue growth could be smaller. 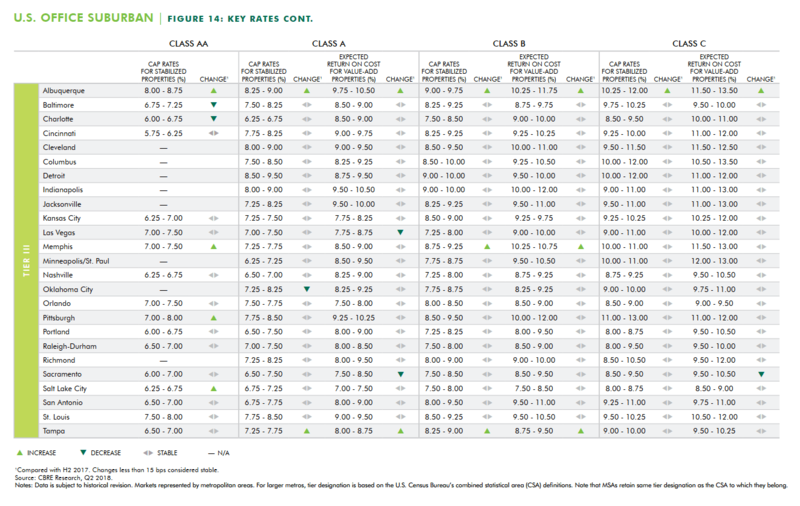 Manulife updated in their slides that their average rental escalation is 2.6%. I checked with them that this 2.6% do not include the mid term escalation. Incidentally the good rental revision in Q3 2018, did include a mid term revision. If they spread out the 2.6% across the entire portfolio, the average rental escalation per year is 2.0%. Some of the WALE is shorter leases (3 years), those normal leases are 5 to 6 years. The longest ones are 10 years. Different REITs have different ways of computing their rental reversion. In the case of Manulife US REIT, the rental reversion is the difference between the last/current year passing rent (after a few years of escalation) versus the new rent that was signed. I would like to get a sensing whether management would lean towards proposing property purchases in The CBD or in Suburban, but in all honesty, I do not have a good idea their difference from an investment point of view. How would an Class A office building in the suburban compare to a Class B office building in the CBD? Turns out I do have a very poor view about their distinct difference. CBD and suburban are just location for properties and cater to different type of work environment. The suburban concept is becoming more popular due to the work, play and live concept and it is something that Manulife US REIT is actively looking at. CBD would be closer to various amenities, and access to various headquarters of other industries. In certain business context, sometimes it makes sense to be situate away from the city. Manulife shared with us how Michelson in Orange County is situated away from Downtown Los Angeles but Orange County is still very vibrant. The very rich and high net worth, have made their money, and as they get older, will gravitate away from the down town to settle in a place where they can both tend to their wealth, not be distracted and enjoy a balance of good living. They do not wish to visit Downtown Los Angeles every day. Since they have a need to manage their money and interest, ancillary services such as wealth management, law firms would gravitate towards Orange County as well. Thus Michelson caters to these law firms and wealth management firms. During the great financial crisis, Orange County was badly hit, as the wealth gets severely depleted and the office industry face a downturn. However, when the market recovered, the rich returned, the banks returned, the law firms returned, the demand for office space returned as well. In terms of Class A versus Class B, they did educate me on some differences. If we try to relate to the local context, Class B would be closer to your business park compare to the MBFC. We cannot demolish the columns, ceiling and structure easily in an asset enhancement initiative to create a bigger floor plate to attract higher quality tenants. Class A properties attract those who wish for it to be a headquarter that you wish to show it off to your clients. 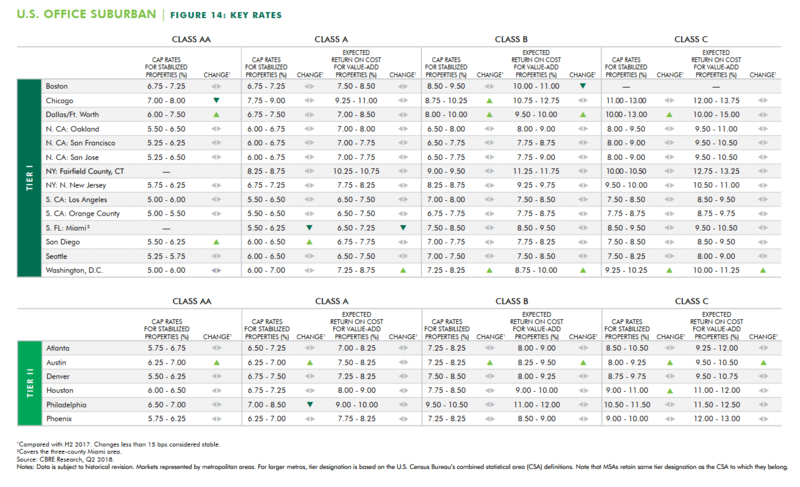 Manulife states some reasons why they would steer clear of Class B properties and focus on Class A properties. They think that the higher quality can be defensive. Class A properties attract tenants who wants prestige traditionally and Class B properties typically attracts the small medium size businesses. Since they are an insurance company and does adequate underwriting, they tend to observe that during downturn, the Class A properties’s occupancy tends to fare better. In a downturn, both Class A and Class B rent trades down. 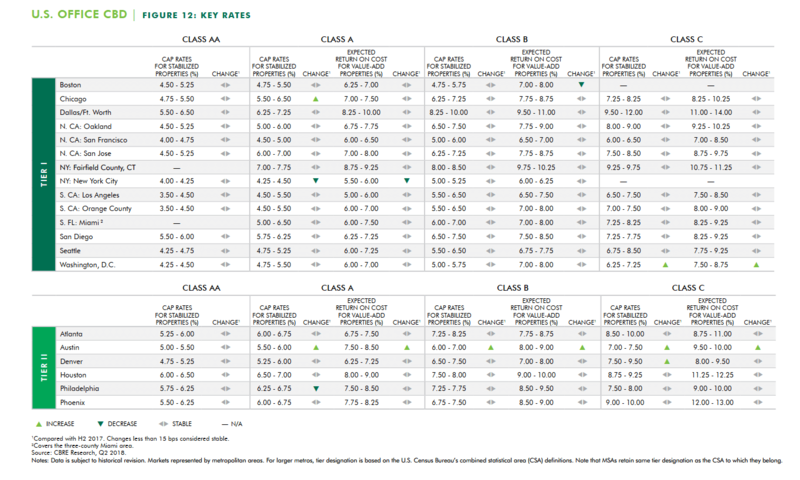 However, the spread change in Class B rent is smaller, versus the Class A rent change. Thus, when the rent spread between what you can get for a Class A rent and Class B rent narrows, a tenant would rather get a nicer looking Class A space. Thus the occupancy of Class A is higher in a challenging climate versus Class B. They would rather maintain that occupancy than to maintain a high rent. Trophy properties are a sort of branding given to the best of the best. They tend to be newer (less than 10 years old compared to 25 years old average). Given this, what kind of properties will they buy? I think they have explained this a few times. What they will propose to the shareholders to purchase will depend on the price, the net property income yield that they can achieve and the quality. Thus, we are priced out on a few markets such as Boston, New York, San Francisco. Atlanta would be an area that they like. What I am satisfied with is that if they are evaluating based on those three factors then things should not be too bad. Is Management able to Switch to a Quarterly Dividend Payout? Management highlighted that non of the foreign REITs paid out quarterly. It is certainly attractive and in my opinion it will be more popular to the shareholders. However, management explained that the reason is that a quarterly dividend is not conducive in time and cost. I will leave a lot of the details not said but if you look at the tax consideration in the rest of the article, they do factor as some of the things the management need to do, to get the cash flow back into Singapore. So a lot of the effort is spent getting foreign sourced income back, navigating through all the unit holder’s W8-Ben form status, the tax restrictions. Once the money is back, the you have to navigate the reimbursement through CDP accounts. UPDATE 28th Dec 2018: Before you read this section, I would like to update that there are major updates to this uncertainty since I wrote this article. The United States Tax authorities have provide their Section 267A clarification proposal and Manulife’s lawyers have looked through the proposal and update via SGX that Manulife’s tax structure was “scoped out” of the proposed regulations, which means that their current Barbados entities will still benefit from the tax shield. The US Tax authorities are not targeting companies with structures like Manulife US REIT. For greater detail, do read Manulife US REIT and Keppel KBS Announced Minimal Impact from Section 267A Regulations and Barbados Tax Rate Changes. Meantime, do read the following part so that you can understand how Manulife US REIT is set up to systematically mitigate the tax shareholders paid to maximize the dividend income paid out. Manulife US REIT and Keppel KBS’s share price recently tumbled due to some uncertainty over whether their dividends are sustainable in light of some possible taxation changes. It seems a lot of the volatility in prices, is the result of the worse case impact of the TCJA tax clarification. This clarification, could be no impact, but also could result in both REITs needing to restructure their entire entity, incur costs along the way, and some drop in distributable income. This tax clarification debacle can be pretty confusing, and due to the technicalities, it is hard to explain to a 5 year old boy. However, in this week’s The Edge, Goola Warden explained it damn well in Yield watch in a piece titled: Taxing questions for US-based S-REITs as DPU yields expand. Goola met up with the management, particularly Manulife US REIT’s CFO Jag Obhan, who explained a lot of the technical side of things. In particular, Jag explains 4 pillars that hold Manulife US REIT’s tax structure together to ensure that as much rental income flows through to the unit holders as possible. 3. USA Portfolio Interest Exemption Rule (PIR). Normally, income that leaves the USA, is automatically charged 30% withholding taxes (like your stock purchases of Apple in NYSE). However, a group of shareholders with diverse nationalities in a Singapore company, for example, can lend a shareholder loan to a USA subsidiary ( in this case the private USA REIT ). THE USA subsidiary would need to pay the diverse group of shareholders an interest income on the debt loan to it. Manulife have used this PIR for their cross border investments, their infrastructure funds and unit trusts. Other multi national corporations, funds have made use of this rule as well. To their info, this PIR rule have been in existence for a long long time, and was not affected by the Tax Cuts and Jobs Act announced in Dec 2017. 4. Distribution from the US to Singapore through a hybrid entity in a combination of dividends, interest payments and repayments on shareholder loans. TCJA introduced section 267A, which disqualified “related party” tax deductions and distributions into a hybrid entity. In the past, the use of hybrid entities with hybrid transactions are common in international tax planning strategies. The interest expense reduces the tax payable for the USA subsidiary by reducing the taxable income. Under Section 267A, hybrid transactions made to and from hybrid entities no longer are qualified for tax deductions. In the lawyer speak: deductions would be disallowed if certain “disqualified related party amounts” paid or accrued to a related party were made pursuant to a hybrid transaction or made by or to a hybrid entity. Under the old structure for KBS and Manulife US REIT (Before Dec 2017), they would have violated #1. Thus, both of them restructured by including a Barbados based structure. Then when the income is send back fro Barbados to Singapore there is no withholding tax payable. Under this structure, Manulife US REIT is not considered a hybrid security under US tax laws as the interest income from the shareholder loans is taxed in Barbados, and does not claim deductions. It should be emphasize that this structure has been put in place by Manulife US REIT and Keppel KBS one or two days after the Tax Act announcement in Dec 2017. Perhaps here is an illustration of how these tax shield work from Manulife’s point of view. The properties are held in a holding US private REIT company. Suppose this USA entity earns a gross revenue income of $100. Out of the $100, they have to pay $20 in mortgage interest expense for the property portfolio’s onshore mortgages, which is mandatory. So you have a net rental income of $80. For tax purpose, the tax authorities recognize depreciation of the properties, over a particular lifetime. In the USA the properties are usually depreciated over 40 years, which comes up to approximately 2.5%. So for a portfolio with asset cost of $1700 divide by 40 years, the depreciation would be about $40. This depreciation is not a cash outflow. What is left, you could shield it with interest expense of $40 dollar. You end up with 0 taxable income and thus you do not pay a 30% withholding tax on $0. 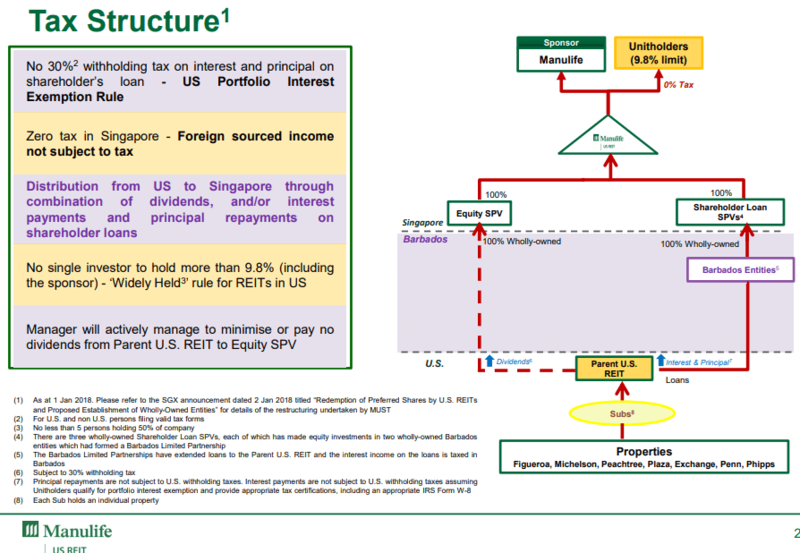 Manulife US REIT and Keppel KBS current structure meets this requirement, hence it is tax efficient. Should the USA entity be considered an hybrid entity, and interest expense is not deductible, it won’t be the $80 net rental income that is subjected to the 30% tax. 50% of it is protected by depreciation. Since only 50% is affected, the maximum tax that could be levied is 0.5 x 30% = 15%. So you could see that if depreciation is done more aggressively the EBIT could be minimized to $20-$30. Instead of a $12 tax it might become a $6-$9 tax. Usually, these sections and codes in the Internal Revenue Code can be vague and organizations would have questions and will keep asking the IRAS. So IRAS would pay attention to the feedback, and then provide clarifications to the tax act that was announced. So these clarifications would typically provide more color to what can qualify and disqualify for various sections. What scared the markets was that Keppel KBS said the clarifications would be out “imminently” and in the worse case scenario the income available for distribution to be down by 30%. Manulife US REIT gave a clearer guidance about the extend of the impact, while Keppel KBS remained quite all these while. Deutsche Bank thinks that the clarifications would clarify what tax deductions are allowed under Sec. 163(J) and what are disallowed under Sec 267A. Thus it is a clarification of which is which and this should not affect the current shareholder loan deduction. Manulife and Keppel KBS both satisfied this new TCJA. However, they might view that some of these local taxes paid to be too low. That would mean some form of discrimination, and perhaps setting a minimum percentage amount of local taxes to not be deemed a disqualified related party. What is the likelihood? I am not sure. To satisfy this, Manulife could choose another country with low tax, but not so low tax as Barbados. Then it will still qualify of interest tax deduction. They could also choose a location with a tax rate somewhere in between. One example could be Hungary with 9% corporate tax, which will put 4.5% of the distributions at risk. Assuming the dividend per unit to be US$0.06 and share price to be US$0.77. If we restored the 1.25%, the DPU would be $0.06076. A 8.5% shaved on DPU would make the DPU to be $0.0556. the dividend yield will be 7.22%. A 4.5% shaved on DPU would make the DPU to be $0.0580. the dividend yield will be 7.53%. What do I think of this tax situation? The impact of the tax clarification would possibly centered on the outcome of Section 267A. If we reviewed the 4 pillars that Manulife talked about, #1 to #3 should be Ok. The PIR is widely used and have been around for the longest time. It is unlikely to change. If you change that, a lot of funds, in the wealth management side in that country will be affected. USA would likely still wish for foreigners to invest in their country, indirectly through the wealth management industry, to at least put the US dollar in demand. Thus, if both stocks maintain a less than maximum 10% each shareholding structure, this would be taken care of. Prior to 2017 Dec, the last change to the Tax Code of IRS was in 1986. The recent TCJA was proposed in 2013, discussed and passed recently. It took 31 years to change the tax code, which suggest that it is not so easy to change the tax code. By all research, the issue with the section 267A is that what is considered as a hybrid entity is not very clear. And thus further clarifications is required. It could be some countries such as Barbados are listed as countries that cannot be used for tax deductions. I think this would be very grey as where do you draw the line? How low of a country’s corporate tax would have to be to fall within the list? Manulife US REIT could change the jurisdiction and accelerate the deprecation. I have illustrate how moving to Singapore or Hungary, and the impact to dividend yield. You would have to think, what does the market value this property, with its management, versus the risk free rate, and its competition. I think that the likely impact to the DPU is within 10%. If not there is no impact. However, given any reduction in distributable income, I felt the share prices would be negatively impacted, regardless whether these risks are already out in the open. I cannot help but think that, if this tax structure is badly affected, the upcoming REITS by Ascendas Singbridge, and another Grade A property REIT from Keppel KBS would be hard to list. One of the investor referred the management to the capital management adopted. He questioned that if Manulife’s portfolio of office is indeed made up of Grade A and Trophy properties, why does the banks still need them to collateralize the properties to the debt? He compared and contrast to the operating environment for local operators such as Capitaland. Jag, the CFO, explained that this was some sort of restriction on the REIT due to a rule called the Thin Cap Rule. The Thin Cap Rule in the USA REIT environment aims to prevent a lot of shell companies that are “thinly capitalized” from cycling money out of USA. If the company have too much leverage, then it is not a real company. If you take a loan on an unsecured level, then this would violate Thin Cap Rule. Thus, the debt is asset backed. A lot of established countries have their version of thin cap rules. Now after the Dec 2017 TAJC, the Thin Cap Rule does not exist. This means that the management can consider other forms of capital debt. It sort of explained the confusion why they said that their strategy is to have unencumbered properties yet their properties are utilized. If you have assets that have not been used to secure loans, it gives your REIT that flexibility during credit crunch to propose this to increase your chance to secure a reasonable loan. One of the investor propose, why not turned to convertible loans, since the cost of interest would be low, which might work well for them. Manage are comfortable with 5% to 10% of their capital base to be made up of perpetuals (you can read more about perpetuals in this article of mine here). Perpetual is considered an equity, higher seniority than equity, but is a form of debt. 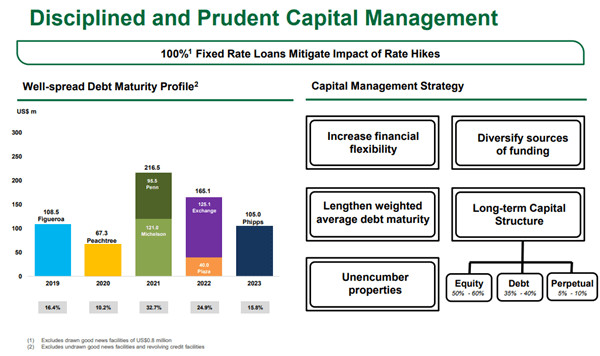 Rating agency would consider 30-50% of perpetuals as debt instead of equity but Manulife US REIT sees them as a cheaper form of debt. This is so in those kind of times when their equity prices is low, and the cost of equity is high, relative to perpetual. This would enable the REIT to still be able to acquire. So Manulife would like to be opportunistic in being able to use perpetual to acquire. I think management tried to solicit some views regarding as investors, what is our preference for equity raising. The first few issues was to increase the liquidity of the REIT. If the liquidity is not increased, then it would be difficult for high net worth investors to exit if they required. This is a strong consideration for the larger, institutional investors. Even if Manulife US REIT reaches a hypothetical 10% yield, the institutional investors would be difficult to invest because they would jack up the share price by themselves, and if they exist, they would bring down the share price themselves. The management is aware that there are institutional investors observing on the side lines to see how they operate the REIT, before being invested. Once you are able to get a few more of these larger investors in, your REIT will have a little more stability. So the first placement was to address this. As the liquidity picks up, it also make it easier for institutional investors to get invested. When the REIT grow bigger, it is easier for placement to happen. The discount offered is also lower and thus this makes acquisitions easier. Once that is done, then they cater to the retail investors. The retail investors have constantly feedback to let them participate in any deals that the REIT has. The 2 investor that gave their views prefers that placements and preferential offering be done. This is because for rights issue, you have to set aside some of your money to be ready for the rights issue, which is not preferable. Preferential offering is preferred because the discount is smaller, yet it allows the unit holder to participate, should there be a need to. Shortly after the meeting, I send in my views. 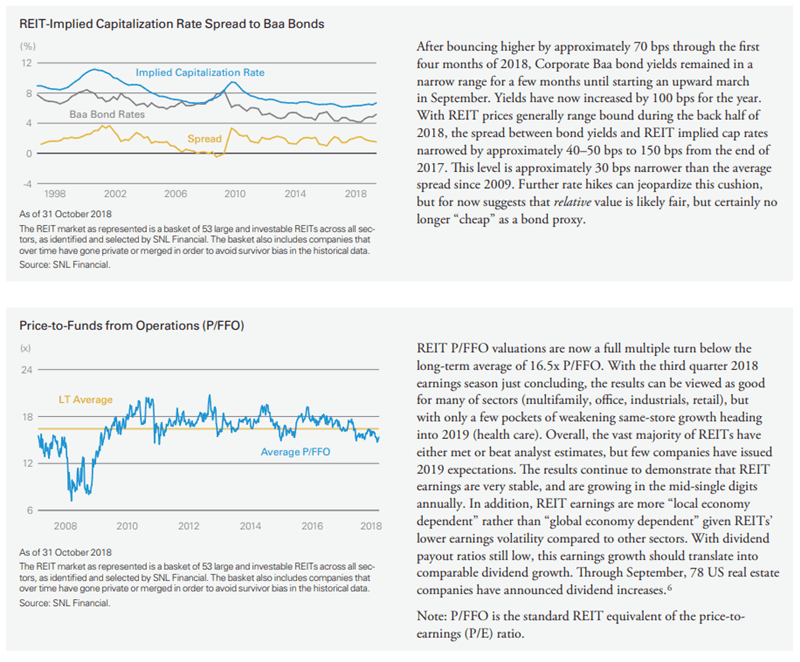 I have this weird view that the REIT should do the capital allocations that in the long term, they could raise money in a more sustainable manner. So for most REITs, there is a maximum that they can leverage. A more sustainable way is to ensure that the REIT have a lower cost of equity. To have a lower cost of equity, that means the share price needs to be strong. For the share price to be strong, it needs to be well supported, and the people that can fund future deals better are the institutional investors. That probably answers the question which financing way is preferred because the institutional most of the time prefer the REIT not to do a rights issue as it create more problem for them. If the institutional are looking for adequate liquidity (as you have explained to us), management that does all the right things, quality assets, strong rising DPU trend, and a track record of making all the right decisions, then they would continue to support because they get a good total return, for the risk, the effort that they put into. As retail investors, aside from speculative special situations, most of the time we prefer to invest in a REIT that we know the management had our backs. The rights issue discount is very appealing to us, the retail investors, but honestly if we look at past heavily discounted rights issues, not many have worked out that well in the long run (meaning the share price became strong and return to where they were). The odd exception was First REIT, or the Ascendas, Capitamall in the past. So my preference is for the REIT to take care of those who are going to give the REIT the large capital to fund future acquisitions, which often entails institutional investors, make the returns and performance strong. The retail investors will join in for the ride. And you could add the uncertainty of Michelson’s rental expiry into the mix. When there is uncertainty, there is risk, and when there is risk, you hope that there is a high compensation. And thus it explains why Manulife US REIT is trading closer to 8%. I think within 40 days, we might see the tax clarification and that uncertainty cleared up. Before this, you have to perhaps factor in the impact to the dividend yield. The dividend yield might be closer to 7.2% to 7.5%, instead of 7.9%. If you look at this, versus the historical dividend yield, for a long time before the rights issue, the dividend yield trades below 7%. Thus even this looks attractive. But we cannot look at the dividend yield versus historical on its own. The interest rate environment is rather different now in that interest rates have rose quite a bit. We typically value REITs by comparing its dividend yield minus the 10 year government bond yield, then compare to the historical. Since the start of the year, the 10 year have gain like 90 basis points (or 0.90%). I have provided 3 dividend yield of 7.9%, 7.5% and 7.2%, depend on how the tax clarification would turned out. Here is the historical Singapore Dividend Yield and the historical Dividend Yield Spread over 10 year Government bonds. A more proper measure would be to compare to the US REIT’s yield spread. The only ones that I can get is some data published by Lazard Real Estate, whose data is rather new. However, I realize this is not a yield spread comparison. It does make interesting data because we are able to see just how narrow the spread of Baa bonds interest rate to the CAP rate of properties. At current the spread is just 1.5%. The value point is when some of the spread reaches 4%. 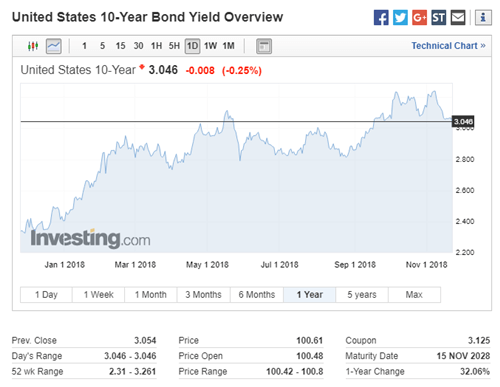 It should be noted that the bond rates that they would borrow at was typically at 6 – 8% (!). Manulife US REIT’s last fixed cost borrowing is closer to 4.4%. This is probably an area of discussion next time, if I have a question to ask. 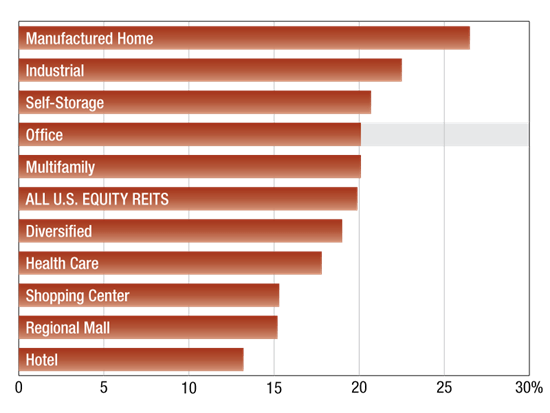 In the bottom section, we can see the historical price to funds from operations for the REIT market. The long term average is 16.5 times. While we do not compute funds from operations locally, something close to be an adjusted funds from operations (AFFO) which is FFO – capex, is our income available for distribution. Generally speaking AFFO should be lower than FFO, so it means equivalently, Price to AFFO should be higher on the average. The valuation, whether taking a more conservative DPU or optimistic one is much lower than the average price to FFO. And its not even a fair comparison. 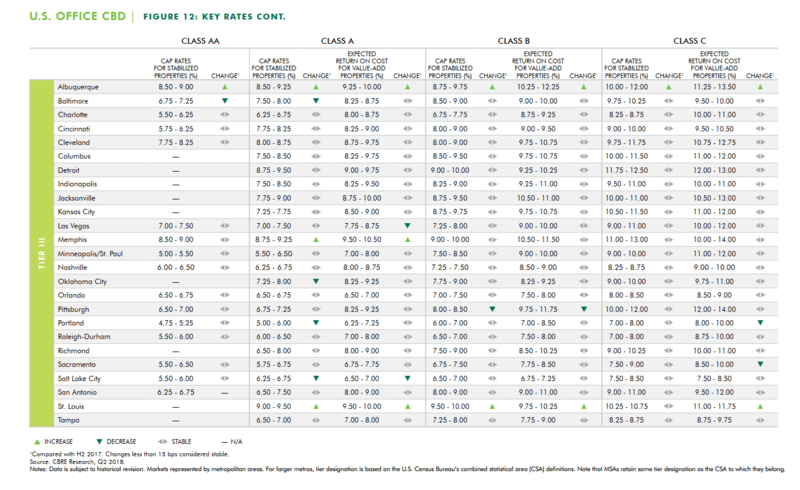 If we were to use Manulife US REIT’s FFO, the price to FFO likely would be slightly lower. If we break down by segments. I think in perhaps 1.5 months we will know whether there are material impact due to the tax clarifications. Perhaps in 3.5 months we will know whether there is rental impact if major tenants at Michelson does not decide to stay on. The rest of my REITs stuff, probably can be found in Learning about REITs below. Do let you know what you think of this. So how would you differentiate between the two.